Happy Monday! I had a great weekend just relaxing and hanging out. It was just what I needed after a few rough weeks. I also got in some stamping time this weekend, and I have decided that I love the Banner Blast stamp set from Sale-A-Bration! Isn't this card just adorable?!?!!? 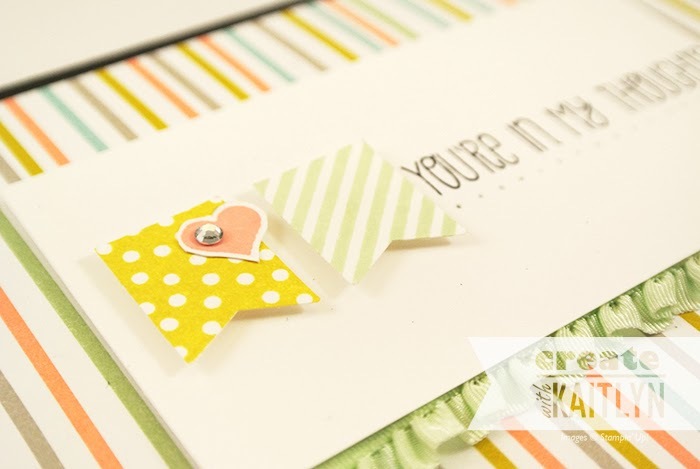 I also used the A Dozen Thoughts stamp set, which is a staple stamp set of mine (as I am sure you have noticed lately. I love the delicate touches of the Pistachio Pudding Ruffle Ribbon and line of paper-piercing. The help to give the card a soft and light feel. The banner images were quick to punch out with the Banner Punch (SAB). The little heart is also in the Banner Blast stamp set; I just stamped it on a scrap of card stock and then cut it out with my Paper Snips. A rhinestone was the last final touch to make this card complete.